In Reykjavik, we came upon some of the most interesting and delicious food options of just about any destination we’ve visited recently. Iceland is full of culinary surprises! If you love to travel for food, you have to check out Reykjavik’s exciting food scene and see for yourself! Be sure to read through this guide to learn where to eat in Reykjavik (plus all the dishes you must order). You’re in for a real treat when it comes to the restaurants in Reykjavik. The variety is stunning, the food presentation is eye popping, and the atmosphere is fantastic. Eating out in Reykjavik can be one of the highlights of a trip there (although rather expensive, so be prepared!). If you’re a vegan or vegetarian, you’ll be happy to hear there are plenty of choices for you too! ⇒ Heading to Iceland? Check out our Iceland and Reykjavik travel guides. While there are dozens of choices for both what and where to eat, even in winter many Reykjavik restaurants are fully booked and require a reservation. When you start planning a trip to Reykjavik, I strongly suggest you also plan what and where you’re going to eat and make reservations, or you may end up being disappointed. ⇒ By the way, this Reykjavik food tour includes quite a few of the great eating spots we’ve listed below. Let’s start with what you should order in Reykjavik, and throughout Iceland, so you can choose what you’d like to try, then find the restaurant that serves it. There are so many ingredients and products in Iceland that aren’t used elsewhere, so it’s a true adventure to eat there. As a foodie, you’ll be blown away by the choices. Likewise, if you’re not an adventurous eater, you might be a little thrown off. Langoustine – They call it lobster on almost every menu, but it’s actually langoustine, a cousin of the lobster. Langoustine can be found in salt water and oceans, and they grow to only a quarter of the size of lobsters. They have a very sweet and succulent meat in their tails. Other seafood like salmon, cod and haddock are popular as well. Lamb – One of the claims to culinary fame for Iceland. They use a lot of lamb and it’s exceptionally tender and tasty. Lamb is an ingredient in the hot dogs you’ll find in Iceland. Lobster or fish stew – The lobster stew that is so famous around Iceland is really fantastic. It’s a mix of lobster stock, cream and spices. Try plokkfiskur – a mashed fish stew. Cured Shark – It’s true that fresh shark meat can be poisonous, but once it’s been cured, the poisonous issue goes away. Cured shark is consumed in Iceland as a snack. Brennivín – This is the national liquor, which is a licorice-flavored schnapps. Minke Whale – the debate rages on. It’s on a lot of menus. It’s up to you to decide. Horse – You might be completely repulsed by the idea of eating horse, but in Iceland (and many other parts of the world) it’s just what they do. If you’re daring enough to give it a try, it’s actually quite good. Served as a filet, it’s tender and very much like a beef steak. Icelandic rye bread, or rúgbrauð, is offered at most meals with butter (or my favorite, salted butter). It’s a staple of the Icelandic diet and it’s so good. One of the best restaurants we went to in Reykjavik was Grillmarkadurinn (Grill Market). I am still thinking about that dinner. The restaurant has a really great atmosphere. The downstairs dining room is all slate and rock walls with slab wood tables. Plus they have the best bread and butter service anywhere. They also have a chef’s tasting menu, as most places in town do, which looked pretty amazing, but we had our sights set on specific menu items so we went a la carte. For an appetizer, we had the trio of mini burgers, made with reindeer, langoustine and whale. It’s one of their specialties, and practically required eating! For our main courses, we chose the Tenderloin of Horse and the Langoustine Tails with champagne sauce. Our jaws dropped at the giant mound of tails that was piled on the plate. It was almost more than the two of us could eat in one sitting, but we did it anyways. It was expensive, yes, but worth every penny and I would order it again in a heartbeat. Another great spot in downtown Reykjavik for lunch or dinner is Fiskmarkaðurinn or Fishmarket. The presentation of the food here is nothing short of awesome. You’ll be amazed. It’s really not your typical fish market. This where you should go if you want to taste the best Icelandic fish. You can go all out and order the 9-course tasting menu, which features so many of the area’s favorite fish, from shrimp tempura, scallop sashimi and salmon maki, to salt cod. You won’t find a better place to try it all. You can also order lobster soup here (in case you don’t make it to Seabarin). If you don’t think you can handle the 3-hour spectacle that is the 9-course tasting menu, you can always order a la carte from the menu. No matter what you choose, you won’t be disappointed. They really raise the bar here. The Sægreifinn (Seabarin) bills itself as having the best lobster soup around. They also have skewers of all kinds of fish, including Trout, salmon, shrimp, cod, scallops, redfish, catfish, plaice and monk fish, among others. The space is really small and can only seat so many people. This isn’t a typical dining experiences. It’s more like going down to the marina and stopping in the little cafe where the fisherman go on break. If you’re looking for a nice sitdown dinner, this is not the place. It can also get a bit touristy, so be prepared. They only accept reservations for up to 4, but if you want to get in for dinner, you should absolutely have a reservation. When we went, just before the regular lunch hour, it wasn’t fully packed yet, so we got a seat at one of the long tables. We ordered both the lobster soup and a few skewers of fish. Both were delicious. The lobster soup was very good. Though it didn’t have the creamy richness I was expecting, the flavor was definitely there. If you want to try to make this soup at home, check out this really great tribute to the owner of Sægreifinn (who passed away in 2015), that includes a sneak peak at their recipe. I’m not entirely sure why this small hot dog stand, located on a side street near the marina, is so famous. But it definitely is, and you’ll figure that out first thing just by the line forming in front of it. It’s been open since 1937 and has been serving the masses what has become known as the best hot dog in Europe. You have to order the hot dog with “the works”. The “works” simply means ketchup, mustard, onions and a special roumalade with relish. It sounds awesome, and I wanted it to be awesome, but the fact is, it’s still just a hotdog. Even Bill Clinton stopped by for a dog once (and his picture is hanging proudly at the stand). The dog did have a nice snap to it. But the best hotdog in Europe? Doesn’t really matter, we’ll still get in line for it! A great spot for a casual lunch is Icelandic Fish & Chips in the marina area. They have the crunchiest, tastiest fish options, along with a dozen or so dipping sauces for your chips. When you order at the counter, you choose your fish, your side dish and your sauces, then they bring it all out to you. If you don’t like fried fish, they also have langoustine, baked fish and a few soups and stews. The sides include potatoes, onion rings and a couple different types of salad. We were happy to see that they also have a few local microbrews you can enjoy with your meal. Everything they serve is either organic, local or both. You can be sure you’re getting the freshest possible fish. The restaurant is larger than most, but it does get packed, so if you know you want to go for a specific meal, you should reserve in advance. You can make a reservation right on their webpage. Now that you’re in the mood for some fast and tasty street food, you have to stop in at Icelandic Street Food. Remember when we mentioned that lamb is a popular dish in Iceland? You can try a hearty, warming version of lamb stew here. 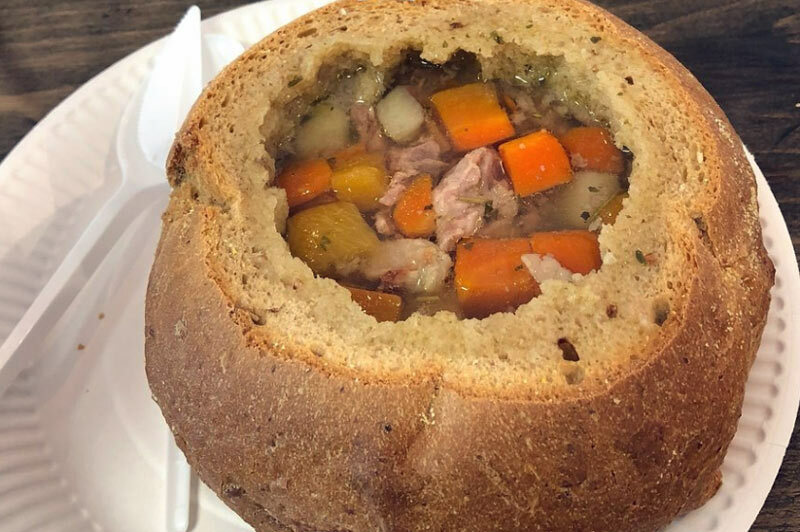 And it comes in a bread bowl. And if you want more, they offer free refills. One of the best things about this place is the atmosphere and the friendly service. It’s also one of the more affordable lunches you can find in Reykjavik and it’s very filling. They don’t have an extensive menu – but you go there for the soup, so that’s not a problem. Another popular spot to eat in Reykjavik is Tapas Barinn, a Spanish-style restaurant serving Icelandic specialties in tapas form. You can find some pretty interesting dishes here, so it’s worth a stop to try these specialties. They also have a special called the Icelandic Feast that includes 7 of their popular dishes, like Smoked Puffin in Blueberry Brennevin sauce, Icelandic sea trout and minke whale, plus a shot of the naitonal liquor, Brennevin, and dessert. I would highly recommend this place. It’s tiny inside, and it gets packed immediately upon opening, but it’s definitely worth it to try such unique and delicious Icelandic dishes. You are going to need a reservation to eat at the Seafood Grill pretty much any time of the day. It’s very popular, and for good reason. While the entrees are quite expensive, the portions are large and the food is outstanding. It’s not just seafood here either. One of their best dishes is the lamb, alongside the fish of the day, of course. One of the best deals is the three-course lunch special, but they have a few different types of “grill” menus, like the Taste of Iceland menu and the Grilled Lobster Feast. The atmosphere is relaxing and inviting, and the service is always top notch. If you’re looking for fine dining options, Nostra is the place. The presentation and atmosphere are a delight, without feeling stuffy or traditional. But it’s the impeccable food and wine pairings that makes us recommend Nostra. When you go, be prepared to indulge in one of their tasting menus. They have a 4, 6 or 8 course menu. You can also have wine pairings to go with the courses. They use all Icelandic ingredients in their dishes, so you can expect to try a variety of the things we mentioned in the list above. They strive to stay true to the region while preparing delicious artful plates of food. They even have their own herb garden at the restaurant. If you’re vegetarian or vegan, they have a menu for you as well. Most travelers to Iceland stop by The Blue Lagoon for a swim in the thermal waters. But you can’t stay in there forever! When the prune hands start to form, you done your bathrobe and go for a fancy lunch at Lava, the fine-dining restaurant located just steps away from the pool. While it might feel strange at first to be dining in your bathrobe, you’ll soon forget all about that as you fall instantly in love with the food on your plate. The chefs at Lava focus on traditional dishes with local ingredients, melded with world flavors. For lunch, there are various options in a 2- and 3-course menu, like the Icelandic Gourmet Menu that features arctic char and lamb fillet. For dinner, there is a 4-course tasting menu with optional wine pairings. Many visitors to Iceland start their trip in Reykjavik, which we highly recommend. It’s a fun city, with plenty of things to do, and nice places to stay. Iceland is creating world-class cuisine and stylish, high-class dining experiences that certainly exceed any expectations I had for this small island. Now is the time to visit Iceland and experience the best in Icelandic cuisine. If you’re spending a bit more time in Iceland, outside of Reykjavik, check out this post for more places to visit in Iceland and a few more food options! Want help planning a trip to Iceland? ViaHero helps travelers plan independent trips to Iceland. It’s an easy-to-use service, where a local expert will help you plan a trip that meets your expectations and specifications. The planning service will help you put together a fun and exciting itinerary and it’s very reasonably priced! You can even use our coupon code SAVOREDICELAND for a 5% discount at checkout. Where to eat in Reykjavik, Iceland, and what to order! This entry was posted in Food and tagged Iceland, Reykjavik. All of these look so tasty! I am heading to Iceland next week, I am looking forward to trying the fish and chips place and of course eating all the hot dogs! You’ll have to let us know what you think of the hot dogs. Julie and I did the tasting menu at Fish Market when we visited and loved it. We tried smoked puffin, and grilled whale, which tasted way better than I anticipated. But I must say, I’m sure jealous about that pile of langoustines. What a portions! They are one of my favorite shellfish, so I would certainly do my best to finish that plate! Fish Market is one of our favorites. If you can only have one meal there, it would be a toss up between Fish Market and Grillmarket. The langoustine was pretty amazing. I saw the lobster soup on the TV the other day. We tried the hot dogs when we were there, but we found it so expensive that we were a bit put off to go into a proper restaurant. Yes, it’s really expensive in restaurants in Iceland. There are a lot of great casual, less expensive choices though, like the hotdogs and even the lobster soup I spoke about. Discussions we had whilst there, as well as subsequent research actually suggests Whale is not really a way of life for Icelanders. Yeah, I avoided the whale while there. I had the most amazing lamb sandwich though! So good. I think I would have to get familiar with the local McDonalds in Iceland. LOL I’ve heard how awesome the puffin in but its psychological for me, I couldn’t do it. The lobster feast looks very appealing though. Hah. Don’t worry, there’s plenty of other things to eat. While I have been thinking about Iceland, haven’t really given much thought about the food though. But now, thanks to you, I’d definitely try the fish and chips, and the tasting menu at the Fish Market! The 3-hour 9-course menu sure has got me curious! It’s a beautiful presentation too! Very worth it. Great list! I have yet to go to Iceland . Puffins , not for me. Although I have seen some outlandish dishes during my travels, I have never had the courage to eat them . LIke someone above said, it is probably psychological. Everywhere I go, I’d try to find my favourite meal, fish & chips, so I’d definitely try Icelandic fish & chips! Would also consider fish market’s tasting menu but a 9-course meal over 3-hour period sounds a bit too much perhaps (although I’ve actually done a 7-course meal over the same no. of hours before) so yeah, I’d give it a shot! Btw, funny how before this I only think of landscapes when it comes to Iceland but now you’ve made me think about their food too. Your pictures are so beautiful. As always with you guys my mind is on food. Iceland is in my to go to list and I hope to get to it this year. A couple of questions… Does Langoustine taste like Lobster? Lamb is my favourite meat and I’d love to try the hot dog version. Ive head of people eating Horse but Puffin… I saw them in Newfoundland. They are cute. Nancy, my best recommendation for breakfast is The Grey Cat. It`s not too expensive and it`s good. All of these are about a 15-20 minute walk from your hotel. I think that`s walkable, but you might want a taxi if you can`t walk that far.